U.S. Treasury Secretary Timothy Geithner went to China in April to attempt to get that nation to change its policy on valuing its currency, the yuan (also called the renminbi). Beijing has tightly linked the value of the yuan to the U.S. dollar, a policy which many economists believe undervalues the Chinese currency and gives the People's Republic an unfair advantage in world trade. About three weeks later, Chinese President Hu Jintao came to the U.S. for arms control talks, and he and President Obama spoke with each other about the currency issue as well. The U.S. decided not to officially name China as a "currency manipulator" on April 15. That label would have carried all sorts of sanctions and could have started a trade war. But the Obama administration's decision to stick to more diplomatic efforts appeared to work: In June, China said it was loosening the yuan's tie to the dollar. The Chinese move to let the yuan float within a wider range should lead to the currency rising in value. Now it appears that while China didn't lie about its decision, it may have exaggerated. On Wednesday, the central government in Beijing said it will keep its currency at a "basically stable and reasonable" level, the Associated Press reported. The country's foreign exchange regulator suggested that pressure for the yuan to rise is easing due to Europe's debt woes, and added that a growing purchase of dollars was easing the pressure for a strengthened yuan. 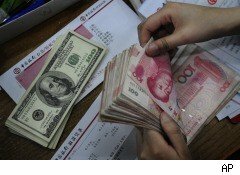 "We will dynamically manage and adjust the floating of the renminbi's exchange rate and keep it at a basically stable and reasonable level, the State Administration of Foreign Exchange said. That will work -- until it doesn't. Right now, investors are buying dollars more heavily due to fears about the euro, but a pullback on dollar purchases could put the whole matter back where it was in the early spring.